Due to emissions regulations changes the glory days of the muscle car soon came to an end. However, 1971 proved to be the final year of the Hemi and the 6 pack. 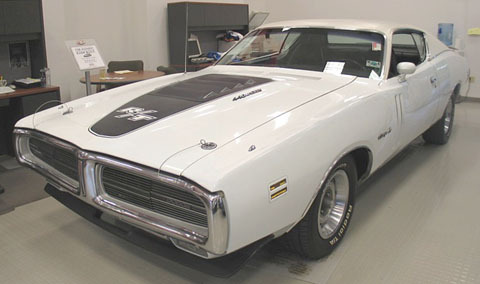 The 1971 Dodge Charger underwent another sheet metal change. However, it never got away from its luxurious and musclar appearance. Most notably changed on the exterior are the rear roof pillars which not angle in the opposite direction sloping slightly away from the driver. Another change in the lineup was that the Super Bee moved from the Coronet body style to the Charger body style. The 1971 Charger body style would remain until the end of production in 1974. Super Bee: Bulge hood, decal, stripe package, 383 was standard motor. Rallye: The final "performance" version of the Charger was the Ralleye edition. It included door vents, a blacked out grill and a bulge hood.The R/T and Super Bee packages were offered for only the 1971 year.